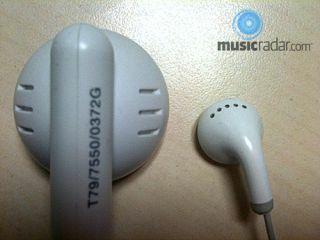 Apple iPad earbud headphone images leaked? With much speculation about whether or not Apple's soon-to-ship iPad will be a game-changer for media consumption, at the very least it's guaranteed to be a very cool platform for third-party music-making apps. These leaked photographs were delivered on an unmarked CDR this morning, and we believe them to be the first images of Apple's new iPad earbuds, with standard iPod earbuds pictured for scale. Okay, so we're lying. One of the team brought in one of these and we were reminded of the "is that a massive iPhone or a very small man?" jokes that followed the iPad's first public appearances. And it's not even 1 April.